At some point, you may find that a pipe in your home has burst. At some point, you may find that a pipe in your home has burst. If this happens in your basement laundry room, it can flood the entire basement. You don’t want to have to deal with water damage and its aftereffects, such as rampant mold growth. Here’s how to deal with burst pipes. The first thing to do is to not panic. 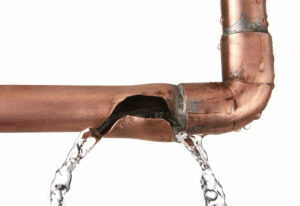 Panicking won’t help you fix broken pipes, and it won’t help you remedy the situation. Find the shutoff valve for your home’s water supply and turn it off. This will help ensure that the water damage doesn’t get any worse. Next, assess the damage done to your pipes. Think about the type of pipes you have in your home. If they’re still made of lead, then they need to be replaced as soon as possible. This means you should get copper or PVC pipes installed instead. Look for cracks, holes, or leaks in other parts of your plumbing. Small problems can eventually break open whenever pipes burst. A pinhole in your pipes can be mended with duct tape or electric tape. A hairline fracture in a pipe can be filled in with some pipe sealant. Larger cracks and holes will need a patch kit to fix. For this kit to work though, you will need to know how to sand your pipes, and you’ll need thick, sturdy gloves to help you get the job done. Finally, if any of this sounds too complicated for you, then rely on the experts. Sometimes, repairing burst pipes requires the use of blow torches and pipe cutters. These are advanced tools that only certified plumbers should use. So while small problems are ones you can handle yourself, when you have a burst pipe in your home, be sure to have a reputable plumber on speed dial. This entry was posted on Friday, November 9th, 2018 at 4:34 pm. Both comments and pings are currently closed.